BenQ W1000+ review | What Hi-Fi? Choosing to bring a projector into your set up is one of the trickier decisions in an AV enthusiast's life. It brings with it all sorts of considerations that can make it seem far easier just to buy a TV. But there's nothing like the big-screen experience, and with cheaper prices, more and more people are tempted: this projector may persuade them. We've seen only few projectors around the £750 mark, and those have invariably been somewhat underwhelming – this BenQ's predecessor is one such example. But the addition of a plus symbol to the model number brings some changes that, along with a price cut, could make all the difference. Most notable is an improved and faster colour wheel and a boost to the claimed contrast ratio. Elsewhere in the compact chassis you'll find two HDMI inputs, a PC connection and even a small speaker. 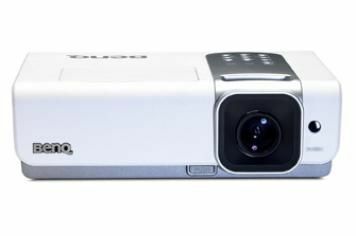 The DLP projector boasts a Full HD 1080p resolution, too. Our first impressions are wholly positive. The remote is neatly laid-out, with red backlit buttons, while the on-screen menus are clear and exhaustive. It can be as complex as you like here in terms of picture management, though it's a shame, if to be expected, that motorised or at least better control of the lens isn't integrated. Nevertheless, for £750, the level of detail on display is excellent. Close-up shots reveal bristles on faces in Terminator Salvation, while expansive landscape shots hold up well in terms of sharpness and insight. The colour balance is strong overall, with natural shades sitting alongside bright, vivid hues as required and decent black levels. There are some issues with fast motion and you'll spot the occasional touch of instability, but nothing we can't overlook for the price. As a first, tentative step in to the world of home cinema projectors, we think the BenQ W1000+ is a fine introduction.